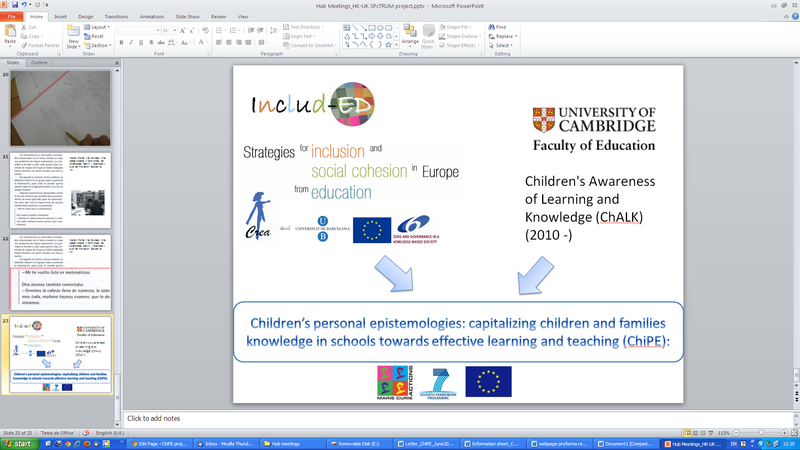 The ChiPE project brings together main contributions from the EU-funded project “INCLUD-ED” and the ChALK project conducted in Cambridge University Faculty of Education. ChALK revealed the existence of sophisticated younger children’s beliefs about knowledge, traditionally uncovered in school. Dialogue played a crucial role in access and elicits those beliefs. Acknowledge and value children’s knowledge from inside and outside school might potentially achieve potentially a more inclusive classroom. Sinergies between previous researches led us to advance scientifc knowlede in the field with this research project. In particular, it focuses on analysing to what extent dialogic learning environments facilitate a more inclusive epistemic climate in classroom to succeed by simultaneously achieving excellence, social cohesion and personal development for all children. ChiPEproject by Rocio Garcia Carrion is licensed under a Creative Commons Reconocimiento-NoComercial-SinObraDerivada 3.0 Unported License.